The supporting association "Katholische Hochschulwerk" is a non-profit organization for the promotion of science, research and studying youth on the basis of Christian belief. The Association is located in the so called Edith Stein House in Salzburg. The Association , which emerged in 1964 from the renaming of the so-called "University Association", was the founding and rebuilding of the Salzburg University in Catholic sponsorship (founded 1884). Representatives of the Association consists of the General Assembly, the Board of Directors, the Board of Directors, the Executive Committee and the Secretariat of the Association the Association line. Retention or leadership of two student indoor homes Wolf Dietrich und Thomas Michels in Salzburg, promoted in the summer as guest houses . The establishment of the supporting association for both of the student homes Wolf Dietrich and Thomas Michels was completed in the year 1884. At that time, the association was called "the Catholic University Club" with the aim to establish the University of Salzburg, which was secularized in 1810 in the wake of the wars of liberation and closed, again in Catholic sponsorship. To do this, all the German-speaking bishops, the Salzburger Parliament and high personalities joined together in partnership. The creation of the yearly summer holiday festival "Salzburg University weeks" prepared the way in 1931 for the establishment of the new University of Salzburg. Finally the project of rebuilding the Salzburg University was undertaken in compliance with - but not as a Catholic University, but as a state one. For this reason the University Club was renamed in 1964 "Catholic higher education work". The preparatory work for the new University of Salzburg should have been done but not in vain. With the reestablishing of the University came the desire to grow and to build their own research facility at the University level. The aim was to work towards an integration of the Sciences and help in being a committed teacher in developing the youth in the Catholic faith. For this goal, Rohracher was built under Prince Archbishop of Andreas in 1961 as the International Research Centre for fundamental questions of Science (IFZ) on the Mönchberg, where it has been his home until today. 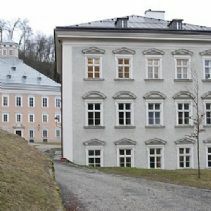 In order to accommodate the students in Salzburg, the Wolf Dietrich house was built in 1963 as one of the first dormitories in Salzburg. Until 1972 the house was used as a cafeteria and to host various university-based institutes, now having found a more permanent place in the University Park Nonntal. In 1976 the site of today's Thomas Michel home was owned by the Dominican Sisters. It was purchased and adapted (at that time only for female students). Between 2009 / 2010 the general renovation took place. The house is now made available for 52 students. In the summer months the Wolf Dietrich and the Thomas Michels are open as guest houses to solo travellers, families and groups.